Defending champions Germany have a convincing lead after the conclusion of the dressage phase at the European Eventing Championships in Scotland. The Germans top the standings on 102.70 penalties with Great Britain on 112.50. William Fox-Pitt had a disappointing day on Bay My Hero and lies in 23rd, with the horse inspected by vets after he completed his test. Britain's Holly Woodhead is second in the individual competition ahead of Saturday's cross-country. The 21-year-old from Wiltshire scored 31.70 in her test on Thursday at Blair Castle, Perthshire, but Germany's Sandra Auffarth overtook her on Friday's second day of dressage with 31.4 on her horse Opgun Louvo. 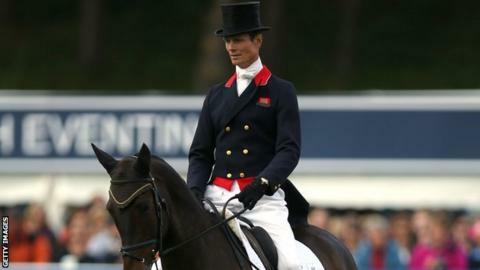 The event comes to a close with Sunday's show-jumping, when the medals will be presented by the Queen. Kitty King and Nicola Wilson had given GB the lead after the opening day of the dressage but their experienced colleagues Pippa Funnell (Sandman 7) and Fox-Pitt both struggled, with Funnell finishing in 19th after a score of 41.3 and Fox-Pitt on 43.00. "It's the first time my horse has seen anything like that," said Funnell. "I could feel the nerves outside [in the warm-up arena], but he was trying really hard. "He is a young horse, and he was just taking it all in. For where he is in his career, I have to be really pleased." As well as Auffarth, team-mate Ingrid Klimke put in a superb display on Horseware Hale Bob to put Germany on track for a third consecutive European title.